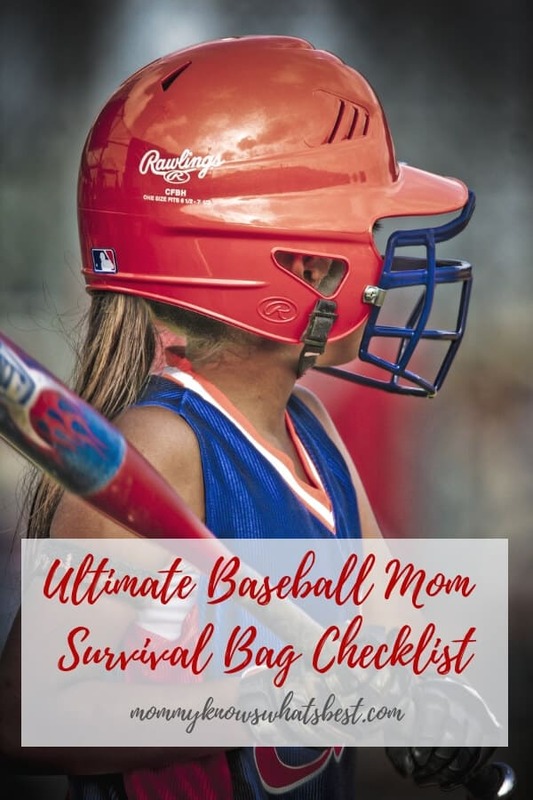 Get a complete checklist of incredibly useful and practical items to keep in your baseball mom survival bag! 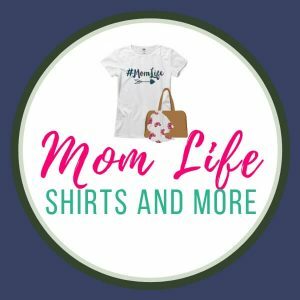 What is a Baseball Mom Survival Bag? My kids have been playing baseball for a few years now. We have played in rain or shine. We have played for hours in the scorching heat and in the bitter cold. We have played at fields with bleachers and at fields where there isn’t any available seating. We’ve played at fields near uncut grass where ticks abound and in the middle of swarms of mosquitoes. Imagine being unprepared for all of that? No thanks! It has helped tremendously to be prepared with a baseball mom survival bag! 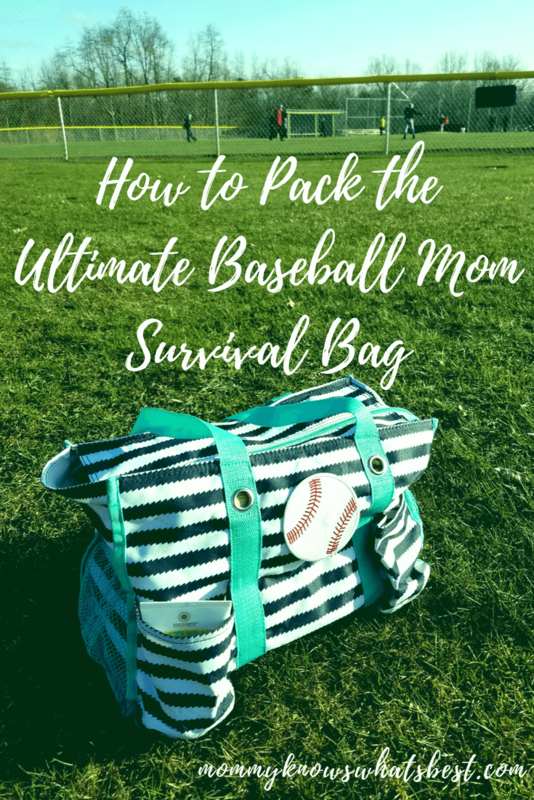 A baseball mom survival bag is a bag full of all the essentials you, Mom, might need when you go to see your kids play baseball or softball. Just like they have a bag full of the items they need to play the game, you can have a bag full of items you need to be comfortable while watching that game. Think about it: do you want to be uncomfortable for a few hours while your kids play ball? Chances are, no! I keep my Baseball Mom Survival Bag in my car at all times, and restock it as needed. I also keep a folding camp chair in the car. This way, if ever a game or practice has been moved to a different day or time, I’m always prepared. 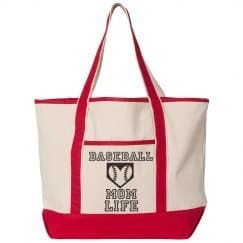 I use a Thirty-One zippered utility tote for my survival bag, but any small tote like this baseball mom bag will do. 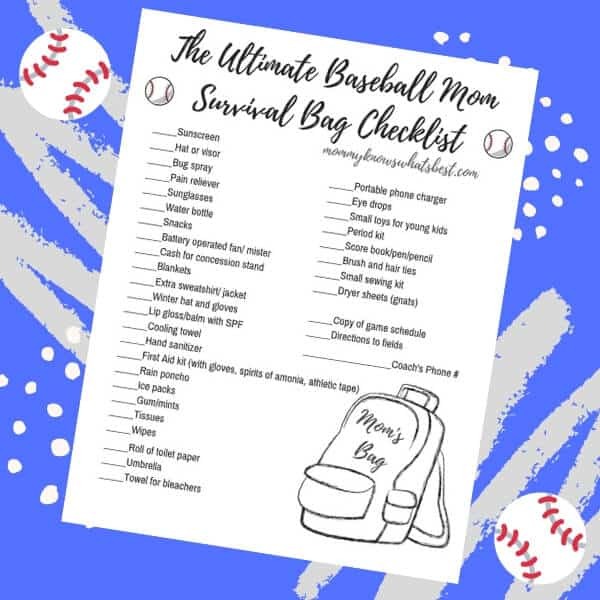 This is my ultimate baseball mom survival bag checklist (find out how to get a free printable checklist below!). Mind you, I have four kids and always feel the need to be prepared for anything! Sunscreen: Even though I apply sunscreen on everyone’s skin before we leave, I still bring extra along. When you’re sitting at a game for a few hours in the sun, it’s a great idea to reapply sunscreen as necessary. Bugspray: I bring bugspray that protects me from gnats, mosquitoes, and ticks. My favorite spray is the Avon Skin so Soft Bug Guard Plus Expedition SPF 30 Pump Spray. It is DEET-free, PABA-free, dermatologist-tested, and hypoallergenic. It works very well to keep the insects away, plus it has SPF. Sunglasses: Protect your eyes from the sun and protect the umpire from your glare with a stylish pair of sunglasses. Water Bottle: It can get hot sitting in the sun watching a game. I bring my stainless steel insulated water bottle that keeps my water cold for hours. It stays super cold thanks to the narrow stick ice cubes that actually fit in the bottle! Cash for concession stand: Most fields have concession stands, which help raise money for the local baseball league. And let’s face it: chances are pretty good that your kids will want to get a snack from the stand, so why not be prepared? Blankets: Blankets are great for sitting on the ground or for staying warm. While I keep a bigger bag with extra blankets in the car, I include a portable picnic blanket in case we need to sit on the ground and a fleece blanket to keep warm. Both fold up pretty small so they fit nicely in the bag. Extra hoodie/sweatshirt: Our home fields are on top of a mountain, so it gets pretty chilly up there. I bring an extra hoodie with me to ward off the chill. Lip balm or gloss: I don’t go anywhere without my lip gloss. I just don’t like having chapped lips! Hand sanitizer: You just don’t know which fields will have soap in their bathrooms. A little travel bottle of hand sanitizer that hangs on your bag or hand sanitizer wipes will be useful. Ice packs: Again, the coach probably has some, but I keep a few small ones in my bag for my other kiddos. Gum/mints: You’ll probably be talking to other parents (yes, even us introverts talk to people), so why not have fresh breath after consuming your concession stand hot dog? Wipes: I keep a pack of baby wipes with me at all times since they’re great for cleaning off hands and faces. Umbrella: Some teams may call it quits when it rains, but others refuse to quit unless there’s thunder and lightning. A large yet compact golf umbrella should keep you dry. Towel for wiping off wet bleachers: Wet bleachers are no fun to sit on. Bring a small towel to wipe them off if it rained. Extra phone charger: I need my smartphone ready to go at all times, not only for the obvious phone capabilities, but also for capturing photos and navigating our way home from far away fields. I actually keep two extra portable phone chargers in my bag just in case. Copy of schedule: Ever show up to a field but no one is around? It’s handy to keep an updated version of the team’s schedule in your bag just in case. Make sure to have the coach’s phone number on it as well. Directions to fields: It wouldn’t hurt to have printed out directions to the fields, just in case your smartphone or GPS loses reception. For more items, check out the helpful comments below! I updated the printable list with some of the suggestions. Quite a few of the comments even have great ideas of what to add to player bags, like extra socks, belts, a change of clothes, etc. Baseball moms! What did I miss? Would this list help to keep you prepared? This list might seem overkill for some, but honestly, as a mom of four kids, I always feel it’s better to be prepared for anything! 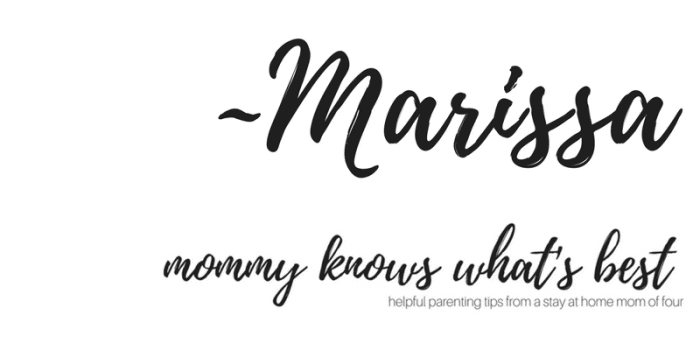 You can find my Baseball Mom Survival Bag Printable Checklist (updated thanks to the awesome suggestions below!) in my Resource Library. Are you ready for this baseball season? I know I am! Good luck to your child’s team! This blog is a participant in the Amazon Services LLC Associates Program, an affiliate advertising program designed to provide a means for sites to earn advertising fees by advertising and linking to Amazon.com. Thank you for your support. That is the coolest bag!! A baseball mom survival bag is a great idea to be prepared for anything. Sunscreen is a definite must! I seriously needed this the last month! I’m a new baseball mom and it seems like I’m never prepared! Haha! Thanks for the tips! Never thought to pack a bag like this! Def going to bring one now that the season has started. I want to know where you got that bag?! Where did you get the baseball patch? And did it stay on well? great list! I’d add a cooling towel or two, a spray mister and we always have a really good first aid kit with gloves and athletic tape. My husband likes to have an extra bat wrap and we have a bat sleeve, extra socks and a visor. our sport cart has a rack built in to hold the camp chairs and our thirty one bags fit in all perfect. cooler always has frozen water bottles (that melt over the tourney day) and I usually cut up either a watermelon or a cantaloupe in a big tub that she goes through during the day. travel tourneys get a little crazier on the packing list but the close ones are easier. I love my cooling towel! Totally forgot about it. We haven’t experienced travel tourneys yet, but it sounds like you’re well prepared! I like to have a few small toys for the other kids that get dragged along to the games they really don’t want to be at. Small toys for other kids are a great idea to bring along! Never thought of eye drops! Great idea. I have a bag like this. One thing I also have is ibuprofen. This is mainly for the moms, lol. I also keep a few rain ponchos, a hat, brush, battery operated fan and dryer sheets! Yes, dryer sheets. They are GREAT to help repel gnats. I’ve also been known to take a citronella candle for night games. The basebal field is my second home and my #happyplace so I try to be as prepared as much as I can. Love the ideas of using dryer sheets to repel gnats and a citronella candle for night games! Ziplock bags to make ice bags. Salonpas cold spray for instant relief from being hit by pitch. Gold Bond friction relief for chafing and heat rash. From scorekeeing mom and nana with 40 years spent on ball field watching my sons and now grandsons play travel ball. We are always at Softball games. We have girls from 7th-12th grade. I always bring tampons and maxi pads, because unfortunately Mother Nature has a mind of it’s own at times. Always extra socks, sports bra ( my daughter is a Catcher & sometimes during a tourney changes out the sweaty wet socks & bra for dry ones. H Stevens, excellent suggestions for older girls! A small sewing kit it about the only thing missing – I carry all the above and below. Crystal, that’s a great idea! Thanks for the suggestion. I also keep tissues and eye black in my baseball bag! And in the early part of the season, I keep a winter hat and gloves. Having my boys in Travel Baseball, I always include everything on your checklist plus Sunflower Seeds, potable potty, toilet seat covers and a compact STIM/TENs machine for the famous pitcher’s arm. Good Luck travel ball Moms! Never thought of a TENS machine! Having just survived our latest season I’ve added 2 more must haves to our bag. Duct tape cause the games are long enough without having the boys stop every few plays to tie shoes. Also WD40, the rocking lawn chairs are big around here and the squeaking gets old real quick, lol. I am also a baseball mom, 11yrs now. He will play in college starting next week. Your list is awesome but missing one thing…booze! As we all know some of the games can be down right boring if the teams are drastically miss matched or long if it’s good competition. Either way a little creatively hidden hooch helps this baseball mom and my baseball mom crew get through the game. Patty, I’m glad you think my list is awesome! I couldn’t add booze to the list as it generally isn’t permitted, but to each their own! A score book and pen are always in my bag. Keeps me in the game especially when a scoreboard isn’t being used. Also my son likes to know his stats! This looks very similar to my softball mom bag. I also put extra deoderant and a hairbrush with a lot of hair ties in case one of the girls forgot to and i offer to french braid before hang. Sharing a brush is a big no no in my family but it’s an extra brush and if the parents are alright with it ill use it but encourage everyone to bring a compact brush just in case. My grandson plays, and I have a bag much like these that have been described. Mine also includes a roll of toilet tissue in a gallon size ziploc bag. Have used both!–needed the ziploc when a player on the other team missed a pop fly that “popped” him in the eye and no one else had a bag for ice! I always have a roll of toilet paper, paper towels and small bottle of hand soap with me also. Some places run out of TP. Extra belt, socks, and cup for the other players who forget. A change of clothes for your player Incase you go for a victory dinner somewhere decent. Biofreeze, peroxide spray and Benadryl – sports wrap. Empty ziplock bag for ice if needed on a hard ball. Blowpops to help you keep your mouth shut on bad calls and toward annoying fans. If it’s TopGun, the tournament directors number. Umps miss recording OOP HRs and you gotta keep that straight. Awesome list! I also have my own baseball bag. In addition to your list, I keep hair ties, Bobby pins, extra hat/visor, extra tank top, deodorant, and pencils in my bag. Often you will find a few small toys (dinosaur, matchbox cars and action figures) for other kids since mine doesn’t always want to share his. I have a well stocked “baseball” bag actually I have a bag for all sports that I transfer the supplies to! I also carry Coband or a roll of vet wrap for straines or sprains or wrapping that hard to cover injury. A small sewing kit for inconvenient tears that have to be fixed before play can resume. And an extra set of shoe laces! The coaches and players all know that I have this and will come to be for there needs!! I also throw in some scissors. Many times we needed to cut stuff off or bags. We also take hand warmers for those unexpected cold fronts. We kept a infant warm by switching them up in different positions on the carseat to keep her warm. They do come in handy. One of my must haves is a cooling towel for those hot days. My favorites are mission and chilly frogs. Tide Stick! Helpful for drips and spills on light colored unis. I always keep a Ziploc bag with paper plates, plastic silverware and napkins in my bag. I keep a ZipLoc of Must Haves – I’m a 10 year in baseball mom too! In it goes two Shapee markers – one black, one silver – great for writing names on the many bottles of Gatorade and Water in dugouts. Sunflower seeds. Empty small water bottles for sunflower seed ‘dripping’s’. Washcloth, for the instant ice pack, alcohol wipes for sweaty pitchers palms, eye black stickers (the sticks melt!) deodorant. I also used to pack headphones for little ones, who found the cheering to unexpected or loud, and lastly, a camera, to capture those must have moments! Lastly, I have a couple of those reflective blankets, that fold really small for car kits? They come in handy for the New England warm days/freezing night games!